Nene Hilario #42 of the Washington Wizards drives to the basket against the Indiana Pacers in Game Six of the Eastern Conference Semi-Finals during the 2014 NBA Playoffs at the Verizon Center on May 15, 2014 in Washington, DC. David West scored 29 points, and the Indiana Pacers beat the Washington Wizards 93-80 Thursday night to advance to the Eastern Conference finals for the second straight year. 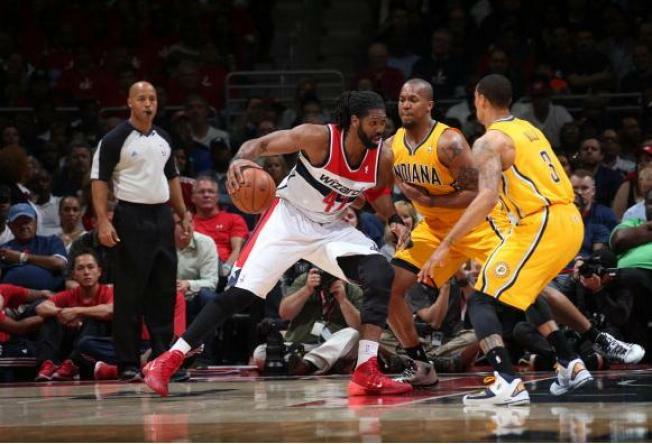 Lance Stephenson added 17 points and eight assists for the Pacers, who won the series 4-2 over the Wizards. They will host Game 1 against the two-time defending NBA champion Miami Heat on Sunday. Indiana took the Heat to seven games in the conference finals a year ago. The Wizards took a one-point lead with 8 minutes to play, but they scored only two field goals the rest of the way as the Pacers closed with a 20-6 run. Marcin Gortat scored 19 points for the Wizards, who ended their best playoff run in decades.